image credit: Russell Neches at flickr under a creative commons license. 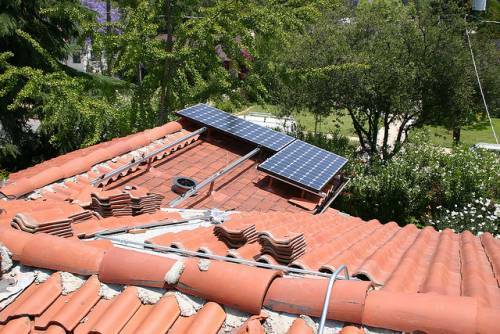 The residential market for solar grew a staggering 60% last year, and the vast majority of new users hired an installer. Why? 1. Making the final connection to the grid by yourself. Actually, this one is worse than the plague. First of all, it’s illegal to connect to the grid without the proper permissions and certifications. Secondly, one small error here can easily lead to grievous injury or death. Yes, it’s hard to watch someone else place the star atop your Christmas tree, but this one’s a no-brainer: hire a professional for the finishing touch. …without planning it perfectly. Even modestly handy people know that sticking these things on top of your house doesn’t require the work of a carpentry genius, but Mr. DIY might have some regrets when his beautiful array that will last for over 25 years…is angled improperly and shaded by the neighbor’s tree for four hours per day. Some important factors to consider: visibility, tilt, temperature, wind, water flow, different types of arrays, array size, off-grid vs. grid-tie…it’s confusing at first, but start with the basics and you’ll be a confident customer in mere hours. You’ve got yourself a set of panels, now you just want the things up and running! Solar power is an investment; you don’t want to handicap it with dumb decisions in the final stage. Installation materials (wiring, balancing system, mounts, etc.) should be part of your estimated cost (our helpful calculators includes them). This one seems obvious…until you look around the web at the number of people that have done it. Save yourself an internet diatribe and match your panels’ expected lifespan to your roof’s. Again, this is your investment we’re talking about. It is absolutely crucial to have insurance covering damage to your home (and yourself) during installation. Missed finding the rafters by a few inches and your roof caved in? There goes the plan for the panels paying for themselves. Building codes, certifications, requirements for rebates, and legal regulations vary by state. Head to DSIRE for some DIY schooling that’ll keep you two steps ahead of the regulators. Free Solar Energy for your Home?